Is This Where Missile Command Goes To Die? There is nothing more tragic in the world of arcades than a disused classic cabinet sitting in some forgotten place as a glorified table. While prowling the back roads and country towns of New York state earlier this week I discovered a hidden treasure in a home built along the Mahopac lake in the 40s. After wandering through the four floors of the ramshackle house, we were heading to our car when I decided to go check out the garage. Sitting in the center of the empty bay was this beautiful Missile Command cabinet, loaded up with power cords, cleaning equipment and old car parts. 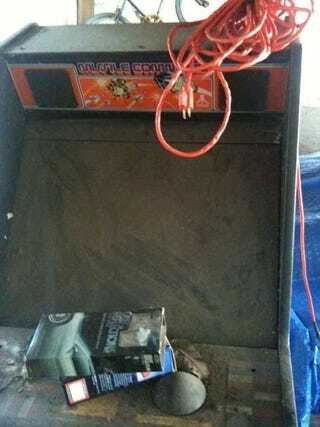 Despite the thick layer of dust on the machine, it looked like the 1980 Atari arcade game was in fantastic condition. I spent plenty of happy summer days on the base arcade in Seoul, Korea playing Missile Command. Like Space Invaders and Galaga, Missile Command is a touchstone game for me, a title that is deeply rooted in my memories of a childhood spent traveling the world with my parents. I'd be lying if I didn't admit that for a second I considered buying the house just to save this poor machine.